Welcome to Slot Games, where you can enjoy 100s of slots, outstanding bonuses, and win fab prizes every day. 65X wager requirements, £250 max bonus conversion, read more for full terms. Welcome to the Slot Games VIP Scheme where there are five exciting levels to work your way up in order to collect daily cashback and amazing rewards! Read more for full T&C's. All VIPs at Slot Games have the chance to win a Free Pizza every week in our Exclusive Pizza Club! Play during our Happy Hours between 3-7PM every Wednesday at Slot Games for a chance to win 500 Free Spins! 65X wager requirements, £250 max bonus conversion, read more for full terms. Win a FREE Amazon voucher when you collect 200 trophies at Slot Games, plus win up to 20,000 FREE Spins along the way! 65X wager requirements, £250 max bonus conversion, read more for full terms. If you're looking for some fantastic promotions and great bonus deals then you've come to the right place and you've definitely come to the right site! Slot Games is full of exciting promotions which will spice up your week, whatever the day! So, what can you expect to receive when you sign up to become a member of Slot Games? Well, we are more than just your typical slot site; why not take a spin of our Mega Reel when you first join up, with prizes that include 500 Free Spins on Starburst and Fluffy Favourites as well as the chance to Amazon vouchers and other great rewards. 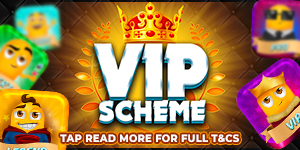 Your VIP progress can be tracked directly from your account and if you reach the top tier then you will receive a free spin on the Mega Reel for every £20 you deposit going forward and 10% weekly cash back as well as a lavish Birthday Bonus. If you are a VIP with another online gambling site then just email us at support@slotgames.co.uk verifying this and you will automatically receive VIP status with us. Every time you deposit £100 or more at Slot Games you will unlock the Turbo Reel, so get fired up as you prepare to win some fantastic prizes and to have your winnings boosted to either 50 or 500 Free Spins, making this a promotion not to be missed. We understand that playing the slots can be very hungry work and that is why we very generous invite our VIP members to participate in the weekly Pizza Club promotion where you can win a £15 Pizza Express voucher emailed directly to you and ready to spend instantly – the perfect treat to accompany an evening of slot-based entertainment! If this already has your mouth watering then all you need to do is simply login to play some of your favourite slots every Sunday and if you are one of the lucky five who wagers the most then you will have earned yourself one delicious pizza- easy! Remember that this offer runs every week, so if you missed out last time, you will have the chance to try again the following Sunday for some more fresh pizza and tasty VIP cashback. You have heard of Happy Hour at the local bar, well get prepared for Slot Games very own ‘Happy Hours’ the perfect mid-week pick me up to get you through to the weekend. Play each Wednesday between 3-7 pm for the chance to win over 10 Free Spins on various slots throughout the evening. So if you feel like taking advantage of the amazing promotions we have to offer then sign up with us today, not only could you have a fantastic time but you could soon be on your way to winning big with Slot Games.